Wet feet are one of the few universal elements of canyoning. Even canyons that are regarded as ‘dry’ usually involve at least a few pools that need to be walked through (unless you pull off some impressive climbing, shimmying, chimneying, and other feats of strength to avoid them). I don’t mind wet feet in the canyon itself, and I’m not usually bothered much by the cold water, but the long walks out can be made rather unpleasant when your feet are sloshing around in your shoes. Wet feet also mean soft skin, which can increase the chances of rubbing and blisters. Given all that, I’ve been looking with some interest at the waterproof socks that are on the market. I decided to try out the SealSkinz Submerge socks, which seemed to provide the greatest chance of staying dry in a canyon environment. Designed for watersports like kayaking, the manufacturer claims they are completely submersible and can deal with “intermittent periods of wading”. Best of all, the three layer design claims to wick sweat and moisture away from your feet, with the inner layer managing moisture, the middle layer providing a breathable waterproof membrane, and the outer shell giving it durability. The Submerge goes over the calf and has a seal at the top that stops water from entering, which I assumed would give it a far greater chance of success than the shorter styles. There are a number of issues that I predicted these socks would face. The obvious one was just how waterproof they would be. The others related to durability. How would the main part of the sock deal with the abrasion of sand, which always enters your canyoning shoes, and how would the waterproof upper section cope with scrub attacking it? I wore these socks on several different trips so I could see how they handled each set of conditions. The first, a ‘dry’ canyoning trip, meant only standing in a couple shallow pools, but doing a lot of walking. The next involved some river walking, which while fairly shallow required the socks to deal with sustained shallow submersion. The final trip, through a couple wet canyons, was designed to really put them to the test, with long periods of deep submersion, including swims and sustained wading. On the first trip I was quite impressed by the Submerge. Early on I jumped into a shallow pool. While everyone else got wet feet, mine stayed nice and dry. Lower down the canyon I found a deeper pool, which I stood in by choice. It was a strange sensation — I could tell I was in cold water but my feet were staying dry! On the walk out they stayed quite comfortable, although by the time I took them off at the car it was clear a lot of sweat had built up, and my feet had a bit of a wrinkly bath look. The second trip was decidedly longer and harder. While the canyon itself was dry, the exit involved walking along the Colo River. While the others took their shoes off and walked barefoot through the shallow water I kept mine on. Despite the quicksand — which regularly swallowed me thigh deep — and the fact that the socks were being kept submerged for a sustained period of time, they stayed dry. This was really appreciated on the hard climb out, although again by the time I was at the car the sweat had clearly built up. The final trip was what I was working towards, and where I really hoped these socks would work. Proper wet canyoning. Again they were very comfortable on the walk in. They remained dry inside for most of the first canyon. Then, as I was swimming through a canyon section of the Wollangambe River I felt the water come in, with my feet suddenly colder than they had been. First it was one sock, then the other soon after. For the rest of the day I had wet feet. There wasn’t much water in there — only so much can fit inside a sock — and the fact that they are waterproof meant the same water stayed there and quickly warmed up, but I definitely didn’t have dry feet! For the walk out this was a bit annoying. Despite the fact that my well drained shoes would have dried out nicely on a normal trip, my feet were still quite wet when I got back to the car (taking the socks off a small amount of water poured out). On the first two trips I had been wearing shorts, so I was able to regularly pull the socks up and ensure they retained a good seal around my upper calf. On the final trip, where I had thermals on over the top of them, I was unable to regularly adjust them, so I had no way of ensuring they were sitting perfectly right. Other than the depth and quantity of water involved, this seemed the main difference, and may have been why the socks failed. The manufacturer warns that liner socks, slender calves, hair or even excessive perspiration can cause the seal to fail, allowing water in. I didn’t use the first, and certainly don’t have the second. My leg hair is also not that thick. Given all that I don’t think these avoidable factors impacted on the sock’s effectiveness. The socks dealt with the wear and tear very nicely (except for one issue). There were no signs of weakness on the sock from sand abrasion in the shoe — which was high given the amount of river walking they did — and the upper section only had a couple minor threads pulled out by scrub. When they were under my thermals there was no damage done to them, but as I indicated above, I think this may have reduced their effectiveness. The one problem that occurred was that the inner layer of one sock separated from the outer. I don’t think this happened in the canyon — rather it was probably from washing them. I’m yet to test them since this occurred, but I doubt they will maintain as good a seal now that this has occurred. Given the cost of these (and pretty much any other waterproof socks) I’d want them to last much, much longer before a problem occurred. For canyons at the dryer end of the spectrum I’d definitely consider using the SealSkinz again, especially if I am wearing shorts or a short wetsuit, allowing me to keep the socks pulled up and correctly positioned. But for really wet canyons — which is where I’d hoped they’d really come into their own — I’m not convinced they are up to the task. In fact, the manufacturer’s own claims are only that they deal with intermittent, not sustained submersion, so it is fair to say I was trying to push them beyond what they are designed for. Trying to use these socks in conditions that are too wet also leads to discomfort, because as soon as the seal fails you have feet that not only get wet, but that will stay wet all day. If this happens then the socks actually make for a more unpleasant walking experience, rather than a better one. That said, I am still considering getting some of the shorter SealSkinz socks for bushwalking. Again, I’m sure the sweat will build up a bit, but for a walk with regular creek or river crossings, or in muddy wet conditions, I think they would make for a vastly improved walking experience. When they stayed dry they felt great. And for walks in moist conditions there is a lot of time to be saved if you can avoid having to stop and take your shoes on and off for each crossing. 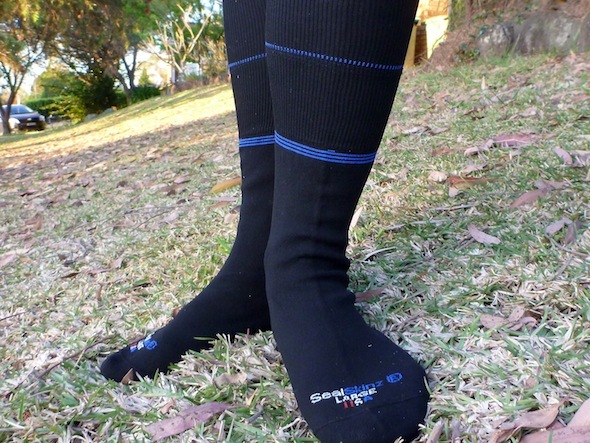 Overall, with a price of more than $50 for the Submerge model in Australia (the other shorter socks are cheaper), I’m not sure these socks will be making their way into the kit of too many canyoners. They are an interesting concept, and I hope one day the technology can improve and make the seal more reliable so the possibility of dry feet even in very wet canyons can be a possibility. Canyoning equipment checklist: What gear do you need?